Matt Accarrino, chef at the Michelin-starred SPQR in San Francisco, has a close, working relationship with Peter Jacobsen, who has an orchard and garden in Yountville. Jacobsen used to supply a lot of fruit to The French Laundry, and now supplies fruits and vegetables to SPQR. Accarrino drives up to help work the garden as often as possible. On a sunny, balmy afternoon, Accarrino and I visited Jacobsen’s garden, where I marveled at the rows of fruit trees, including an ancient-looking fig tree. Despite the wintry starkness of the barren trees, the garden beds were full of life. We clipped and tasted a variety of arugula and cress (including one that tasted intensely of almond extract before turning hot and spicy on the finish), peeked inside the “snail condo,” and pulled year-old carrots out of the ground. 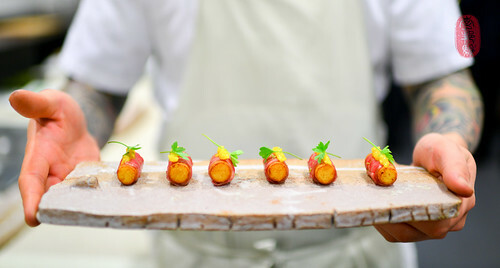 For his dinner at the Twelve Days of Christmas at The Restaurant at Meadowood, Accarrino took those carrots – too fibrous to eat – and juiced them to make a sformato (Italian for “form,” a sformato is usually perfumed with curry spices. He served the sformato with sea urchin and fritters made from carrot top. He garnished the plate with powder made from the leftover fibers of the old roots. 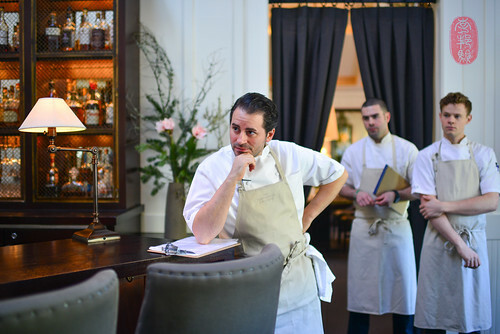 Like that sformato dish, much of what Accarrino cooks at SPQR is rooted in Italian cookery. But, also like that sformato dish, Accarrino brings his own modern, more worldly perspective to his food. For example, one of the canapés he served was a “budino” – a traditional, Italian pudding or custard – of marrow fat and maple syrup bound with bread crumbs. He formed the pudding into cylinders and fried them, wrapped them, right out of the fryer, with with carpaccio of beef, wilted it slightly to create a silky wrapper of fat. It was creamy. It was crunchy. It was delicious. 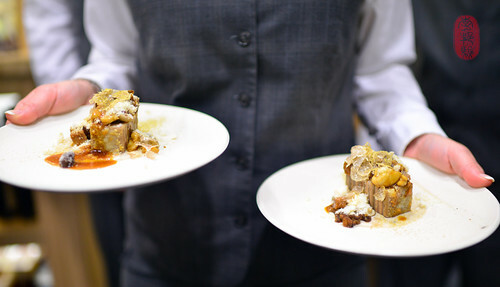 The showpiece of Accarrino’s dishes was his multi-layered “lasagna.” It’s a dish that is perennially on SPQR’s menu, but with a frequently changing list of components. I’ve had one version of it before in his restaurant in which he had layered beet pasta with blood sausage. For the Twelve Days of Christmas, Accarrino made his lasagna with chestnut pasta and layered it with veal, garnished with roasted chestnuts and topped with a shaving of white truffles. I loved Kostow’s black chickpea falafel canapé, which was topped with some pimento mayonnaise and pickled peppers and carrots. It was a hot, crunchy meteor of salt and acid. Kostow’s team also served rosy slices of wild boar with chunky pumpkin seed “risotto.” I loved the smokiness of the meat, and the texture of the risotto. For dessert, sous chef Poncho Vasquez poured silicon (that’s not strawberry yogurt) over pans of unshelled walnuts to make a mold in which was piped a walnut-based pudding (stabilized), filled with a chocolate cremeaux, and frozen. The frozen “nuts” were unmolded and served with roasted chocolate (40%) andshaved black walnuts, and finished with a grating of fresh walnuts. The entire menu from Matt Accarrino’s dinner, with wine pairings by the guest vintner Tuck Beckstoffer Wines is below, along with a slideshow from the seventh day of Christmas at The Restaurant at Meadowood. If you would like to see the photos in a larger size, click through the slideshow to the Flickr album. Kale chip, white bean purée. Seeds and grains, roasted sunchoke, salmon roe. Carrot top “frittele,” sea urchin, lime. Fontina, white truffle, mushroom, dried herbs. Red things, black garlic, mulling spices. Photos: Matt Accarrino’s maple-marrow budino with beef carpaccio; Matt Accarrino, with his sous chefs Brendan Joy and Seth Turiansky; Matt Accarrino’s chestnut and veal lasagna, with white truffles; and the Restaurant at Meadowood kitchen staff, with Matt Accarrino and his two sous chefs Brendan Joy and Seth Turiansky. ~ by ulterior epicure on December 17, 2013.